Bringing your own dish to Holiday celebrations can be a great way to minimize binging on treats. 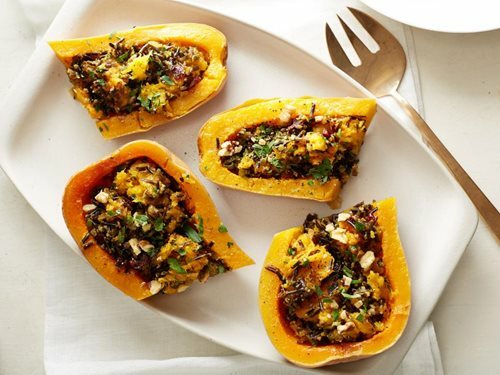 Check out some of our favorite, healthy, Thanksgiving recipes! Everyone knows that the Holiday Season is all about spending time with friends, family, and indulging in special eats and treats. Taking part in all of these things doesn’t have to leave you feeling bad about yourself, though! It’s important not to restrict yourself and miss out on what makes the holidays so special, but sometimes it can be easier than you think to make small changes that lead to more mindful decisions. To make life easier, try bringing one of your own healthy dishes to your Thanksgiving feast! Not only will you feel good about contributing, but you’ll also have at least one dish that you know you can all enjoy and feel good about eating! Who doesn’t love stuffing?! This recipe can be made gluten free or vegetarian depending on which type of stuffing you choose, so the possibilities are endless. These stuffing squares are the perfect way to kick off any Thanksgiving party and pre-game for the feast to come! Preheat the oven to 400 degrees F. Grease an 8-by-8-inch baking dish. Place the cooled breadcrumbs in a large bowl. In a large skillet, heat 1 tablespoon oil over medium heat. Add the mushrooms and cook, stirring often, until browned, about 5 minutes; add to the breadcrumbs. Add 3 tablespoons oil, the onion, salt and pepper to the skillet. Cook over medium heat, stirring often, until the onion is softened and lightly browned, about 8 minutes. Add to the breadcrumb mixture. Add the carrots, celery, and baking soda to the bowl and mix well. Stir in the eggs. Spoon the mixture into the prepared dish and spread evenly; bake until browned, 25 to 30 minutes. Let cool for 5 minutes; cut into 16 squares. This sautéed carrot recipe is salty, savory, and the perfect complement to your main turkey course. It can be prepped start to finish in just about 15 minutes and is sure to please! This recipe yields six servings each coming in at just under 100 calories. Peel the carrots and cut them diagonally in 1/4-inch slices. Place the carrots, 1/3 cup water, the salt, and pepper in a large (10- to 12-inch) sauté pan and bring to a boil. Add the butter and sauté for another minute, until the water evaporates and the carrots are coated with butter. Not everyone likes turkey, you know! Looking for something different that is free from all of the major allergens? Try out this Vegan Wild-Rice Stuffed Butternut Squash for a filling, savory, and healthy alternative to the classic turkey main course! Whisk together the vinegar, maple syrup and 2 tablespoons oil. Brush the flesh-side of the squash halves with some of the maple-oil and sprinkle with 1/4 teaspoon salt and a few grinds of pepper. Put the squash flesh-side down in the baking dish, then brush the skin side with the maple-oil mixture and sprinkle with 1/4 teaspoon salt and a few grinds of pepper. Roast until the squash is fork-tender, 30 to 40 minutes. Let the squash rest until cool enough to handle. Scoop some of the flesh out into a large bowl, leaving about 1/4-inch border of flesh all around. Leave the scooped-out flesh in relatively large chunks. Meanwhile, heat 1 tablespoon oil in a medium saucepan over medium-high heat, then add the onions and cook, stirring occasionally, until soft and golden brown, about 6 minutes. Add the rice, curry powder, cinnamon, cayenne and 1/2 teaspoon salt and stir until the spices are toasted, about 1 minute. Add 2 cups water and bring to a simmer covered, stirring occasionally, until the rice is tender and most of the liquid is absorbed, 30 to 40 minutes (different brands of wild rice may vary in cooking times; add more water if needed). Remove from heat and add to the chunks of butternut squash along with the remaining maple-oil, cherries, parsley, sage, 1/2 teaspoon salt and a few grinds of black pepper. All recipes & Images originate from The Food Network.